We collect structured data on everything we include in the guide, so if you want to find a sushi restaurant near a cinema, just use our category search. 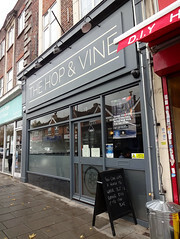 Or if you want to find a Good Beer Guide pub within 500m of Victoria Station, just look here. This is not, and never will be, a commercial guide. We don't accept advertising or freebies, and all reviews are written by our team of contributors. Major changes and additions to the site will always be viewable on our blog, and our Statistics page gives an overview of how active the site has been recently (specifics can be found in the Recent Changes, which are accessible from the navigation bar on every page). Type something into the searchbox (top right-hand corner of the page), or try one of the specialised searches linked underneath it, or click on one of the categories in the sidebar, or take a look at How To Get Started. See also our lists of other websites about London and maps of London.